I was 23 years old and one of my good buddies was getting married at a hotel in Grand Island, NY. 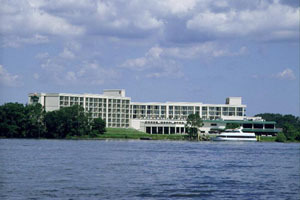 The hotel is called the Holiday Inn of Grand Island and is known to be haunted in certain spots. My best friend and I decided to spend the night in the hotel after the wedding since everyone else was. When we checked in, the counter person gave us a room on the third floor. Now, with the stories ive heard about this hotel, is the pool area, the third and fourth floors, and the dinning room are haunted by a girl in her mid teens who passed away in a fire in this hotel. The day went on with my buddy and i checking into the room, spending maybe an hour there, and then going down for the wedding and not going back upto the room for almost the rest of the day. When i decided to go up to the room and go to bed, my friend who was staying with me was going to the bar with some other people for some more drinks. I slowly fell asleep with the tv on and one light, when i heard the door knock. I woke up too see what it was and i was my friend, so let him in and fell back to sleep. When i fell back to sleep, i felt ICE COLD water being splashed on my legs. It woke me up in a flash and i looked down just to see my shorts soaked with water and the bed also wet. When i firt woke up, i personally thought it was my friend throwing water on me, but i looked over at his bed and he was passed out on the other side of the bed. I never ended up seeing the "girl" but i did notice the bathroom light was turned off whick i left on. Around town at some pizzarias, there are pictures of people with a white spot in the background and there are also plenty of stories of this hotel from other people. One afternoon in the summer of 2014 we were estate sale shopping. My 6 year old daughter begged me to buy her a bridal veil that was only a dollar. She wore it the rest of the day. I knew about the haunting. My fiancé did not. I never mentioned it to either of them. We went there for dinner. We asked when the restaurant opened at the front desk. I was informed the restaurant was closed for remodeling. I told my fiancé I was going to use the restroom in the lobby before the ride home. I brought my daughter with me but she insisted she didn't need to use the restroom. While inside I told her to wash her hands while I used the facility. she turned on the water. While I was coming out of the stall I heard my daughter yell hey! I could see under the stall door the veil she was wearing was forcefully thrown to the ground. My daughter yelled who did that! I came out of the door and my daughter said mom did you see the girl. She is laughing at me can you hear it. I didn't want to scare her because she wasn't scared she was mad the girl was picking on her. later I calmly asked her what happened in the rest room she told me so much I am certain that place is haunted.